Human CTGF (CTF-H52H5) is expressed from human 293 cells (HEK293). It contains AA Gln 27 - Ala 349 (Accession # Q5M8T4-1). This protein carries a polyhistidine tag at the C-terminus. The protein has a calculated MW of 37.4 kDa. 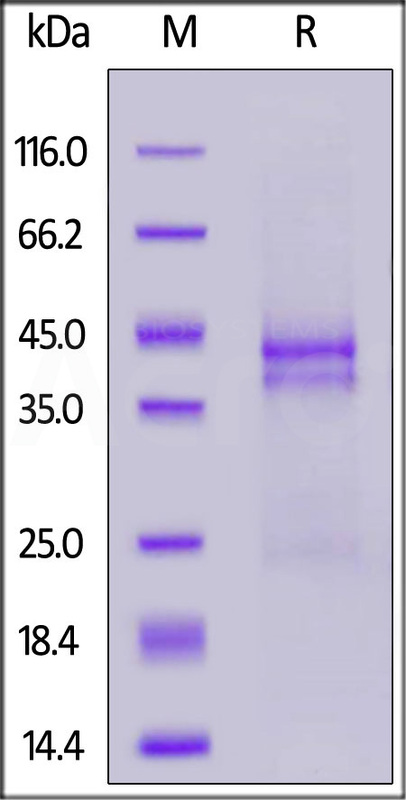 The protein migrates as 38-45 kDa under reducing (R) condition (SDS-PAGE) due to glycosylation. Lyophilized from 0.22 μm filtered solution in 20 mM Tris, pH7.0. Normally trehalose is added as protectant before lyophilization. Human CTGF on SDS-PAGE under reducing (R) condition. The gel was stained overnight with Coomassie Blue. The purity of the protein is greater than 90%. Connective Tissue Growth Factor (CTGF), also known as CCN2, is a member of the CCN (CCN1-6) family of modular matricellular proteins. Like other CCN proteins, mature human CTGF consists of IGF-binding protein domain, a vWF-C domain, a TSP-1 domain, and a cysteine knot heparin-binding domain. CTGF promotes proliferation and differentiation of chondrocytes. Mediates heparin- and divalent cation-dependent cell adhesion in many cell types including fibroblasts, myofibroblasts, endothelial and epithelial cells. Enhances fibroblast growth factor-induced DNA synthesis. Analysis of CCN2 function in vivo has focused primarily on its key role as a mediator of excess ECM synthesis in multiple fibrotic diseases. (1) Faith Hall-Glenn., et al. 2011, Cell Mol Life Sci., 68(19), 3209–3217. (2) Nakanishi T., et al. 2000, Endocrinology., 141(1), 264-73. (3) Ball DK., et al. 2000, J Endocrinol., 176(2), R1-7.